I have already said that in the area of fountain pens, we can see Japan as a huge laboratory of experiments with filling systems. Sure enough, several systems developed in America and Europe have been implemented by Japanese companies –pistons, lever fillers, plungers --, but there are many others –A-shiki, easy-drinking system, Nakahara-shiki, among others—that have never been attempted beyond these islands. To the best of my knowledge, the following pen is an example of the latter. Figure 1. Two of these pens. Brand unknown, but they implement an interesting filling system. The clips carry two different engravings: "NEW FOUNTAIN PEN" on the red unit; "NEW STEAL" (sic) on the greenish grey. The pen has no clear indication of the manufacturer, but its construction is remarkable in many ways. But first and foremost because of its filling system. Figure 2. 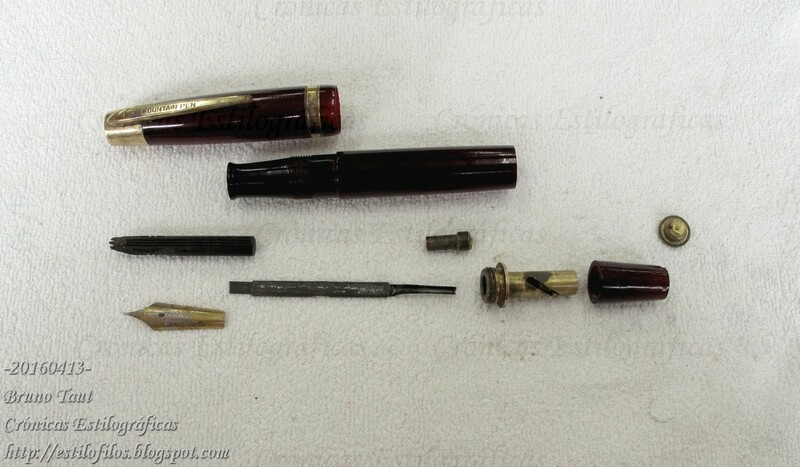 One of the pens almost completely disassembled: the barrel can be detached from the section. But there is a key part not visible on the picture: inside the bulky brass piece, second from the right, there is another smaller piece that moves along this one. It is a sac-based system, but with a very original way of pressing (without twisting) the sac. The pen tail can rotate a small angle –about 30°-- with respect to the barrel. Then, a number of small pieces transform that into a movement along the pen axis. The final element is a pressing bar pushed in that longitudinal movement. Figure 3. These pieces transform the rotation of the back knob (the red celluloid piece on the right) into a movement along the axis of the pen. Inside the central piece there is another smaller one whose notch can be seen through the slit. 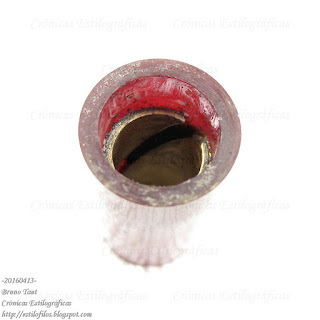 This internal piece is coupled to the external celluloid knob (see Fig. 4). The central piece is screwed to the barrel. Figure 4. This is the piece from which the whole filling mechanism is operated. It rotates with respect to the barrel while driving the small piece described on the Figure 3. Figure 5. On this figure, the whole filling mechanism is assembled outside the barrel. Note how the pressing bard if attached to the set of pieces attached to the actual knob. As is the case with any sac-based system, twisting the rear knob several times is needed to ensure a good filling of the pen. However, the absence of an internal breathing tube, as is the case in many other systems, hinders the full filling of the sac regardless of the number of twisting moves. The basic benefit of this system is how secure the filling mechanism is inside the pen. Operating it is, thus, easier than a lever filler, for instance. The negative side is the number of parts required to transfer the rotation into a push onto the sac, plus the need of a good coupling among them. The construction quality of this filling system is very good—all the pieces, save the external layer of the pan tail and the push bar, are made of brass, and the coupling among them, excellent. 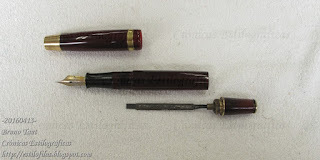 The drawback is a tail heavy pen, albeit the total weight of the pen is far from exaggerated at about 20 g.
Figure 6. 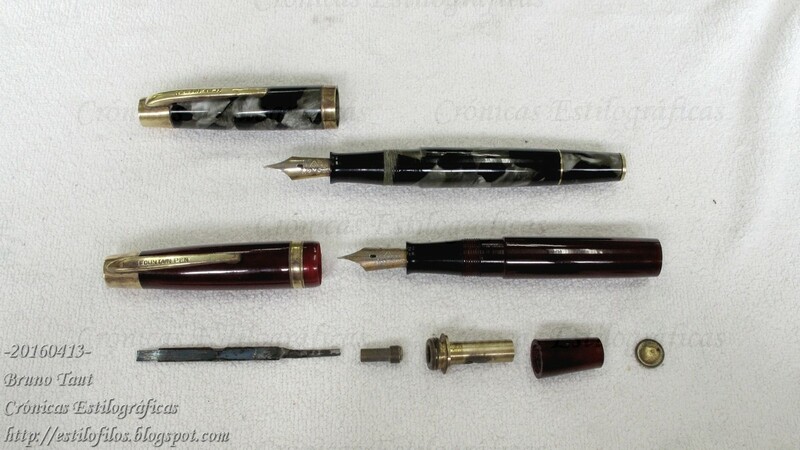 Steel nib, ebonite feed. The inscription on the nib: "SMOOTH / POSTING / 4 / HARDEST / IRIDIUM / PEN.140". 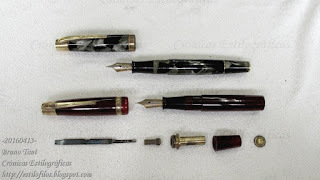 The pen itself is made of celluloid, and several colors were available. The clip carried different inscriptions –NEW FOUNTAIN PEN and NEW STEAL (sic)--, and can hardly be considered as brand names. 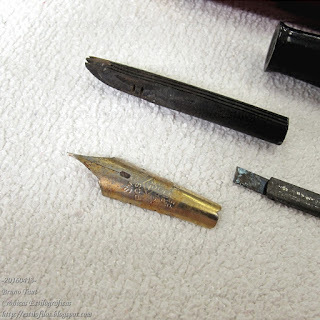 Nibs are made of steel, gold plated. These are, most likely, postwar pens, but the filling system can be found in some Platon (Nakayama Taiyôdô) pens in the 1930s. My thanks to Mr. Mochizuki. Fascinating. As we spoke today, I am fascinated by innovative designs. Thanks for passing by and commenting, Tinjapan. This design is particularly elegant and clean. It is a pity the manufacturer was not really known so far. Looks very similar to the pre war Swan leverless system. Thanks, Carl Clare, for passing by and commenting. Yes, this is similar to the Swan Leverless, but there is a fundamental difference: the Swan twisted the sac whereas this pen just presses it. Some later, port war, developments of the Swan are closer to this Japanese system, but it is not clear whether they went into actual production. Thankyou for clearing that up. I can see why it never caught on as a popular system. Fascinating none the less.